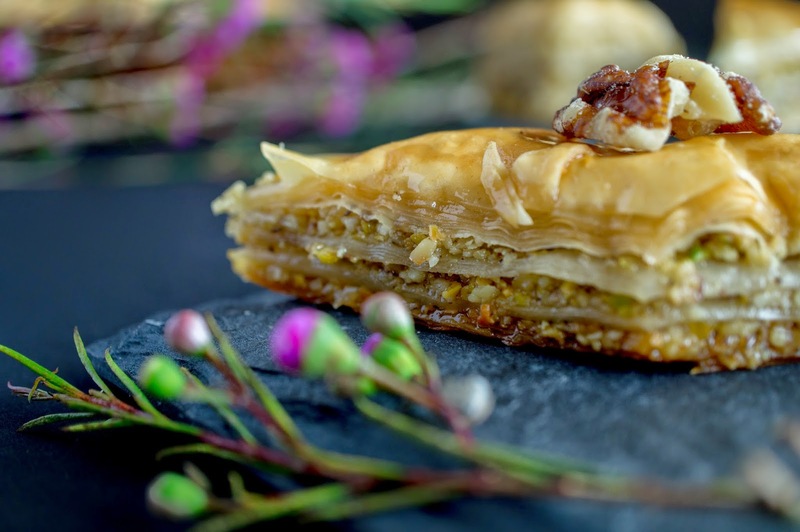 Baklava is a little bit of a confusing dessert because it is associated with both the middle east and Greece. 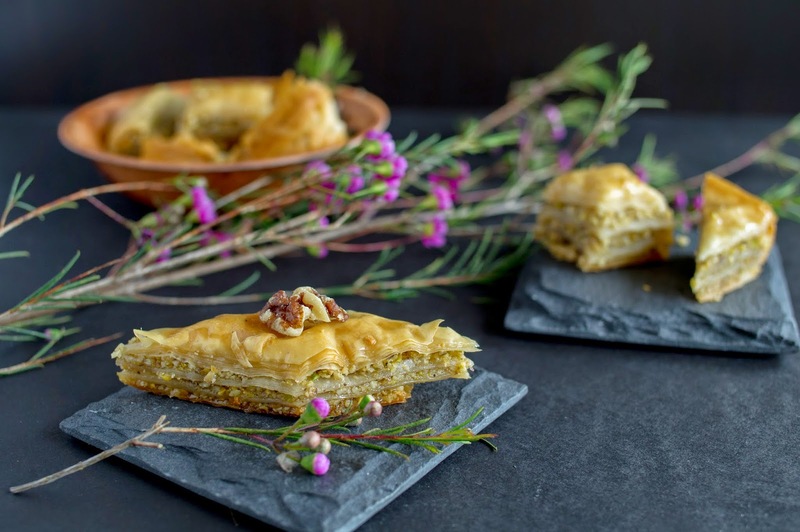 Greek baklava is usually made with walnuts and a honey syrup. 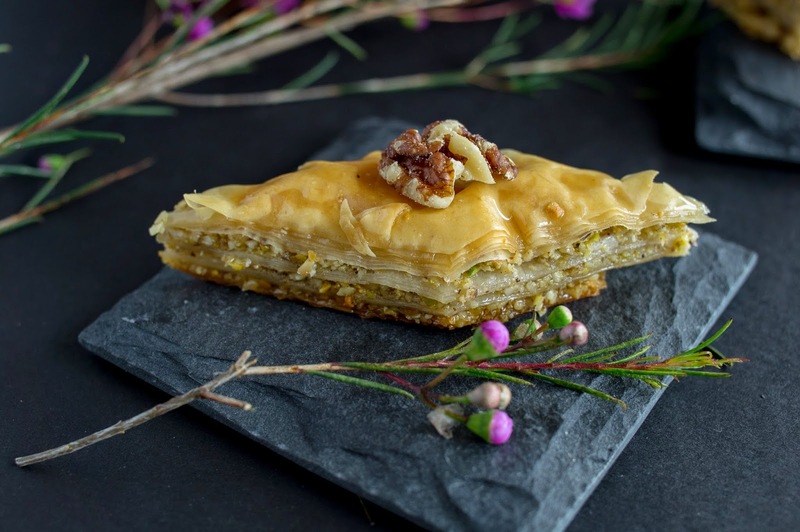 Baklava in the middle east is often pistachio-heavy while Iranian baklava is additionally flavoured with a rose sugar syrup. The Iranian baklava spoke to me because I was excited about floral desserts with spring inching ever closer. But I wanted to do something a bit different too. 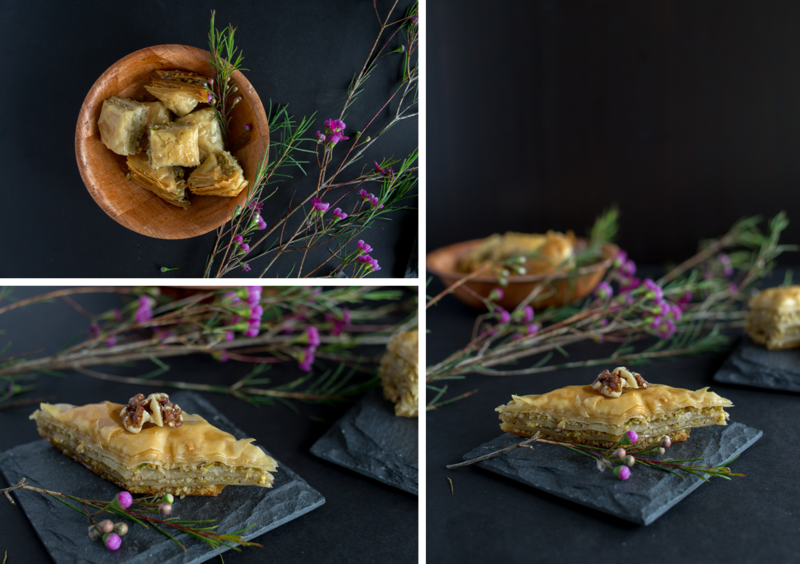 In the end my baklava is a mixture of Greek and Iranian with walnuts, almonds, and pistachios as well as a lavender honey syrup. As it turns out, it’s not so hard to make, especially with frozen phyllo pastry. Crisp nutty pastry soaked with a lavender-scented syrup. The addition of honey makes the sweetness a bit deeper and richer than just sugar. You’ll find yourself picking at the pieces that wouldn’t come out of the pan properly. It’s normal. In a medium saucepan, combine sugar, water, honey, and cardamom pods. Bring to a simmer, stirring occasionally until sugar melts. Simmer until reduced by one third. Add dried lavender, cover and infuse for 1 hour or overnight in the fridge. Strain out the lavender and cardamom pods. Using a food processor, process the nuts to a medium grind. Add cinnamon and stir to combine. Melt the butter in the microwave or on the stovetop. Using a brush, spread the melted butter on the bottom and sides of a 9x13 pan. Lay down one sheet of phyllo, keeping the rest covered with a damp cloth to prevent drying out. Fold the phyllo as necessary to fit the pan. Spread melted butter all over the phyllo. Repeat with 3 more sheets of phyllo for 4 total brushing the top of the last sheet with butter as well. Spread 1/3 of the nut mixture onto the phyllo. Repeat with another 4 sheets of phyllo and 1/3 of the nuts, the another 4 sheets of phyllo and the remaining nuts. 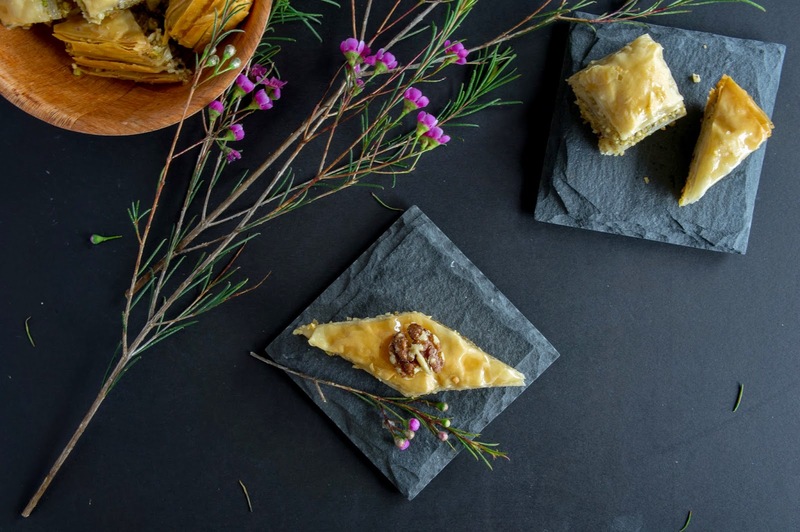 Cover everything with the last 4 sheets of phyllo, making sure to generously butter the top of the baklava. 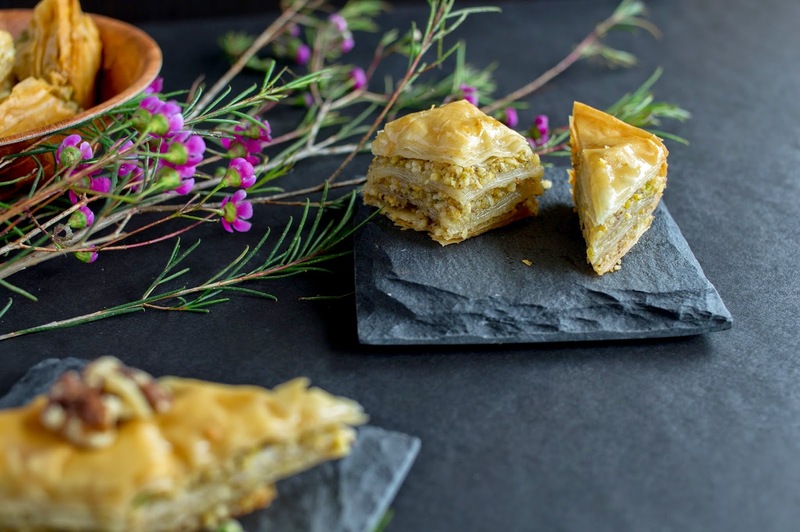 Then, using a sharp knife, slice the baklava into small squares or diamonds making sure to cut all the way through. Cry for your pan a little, but then be comforted by reminding yourself that you’ll have an entire pan of delicious baklava. 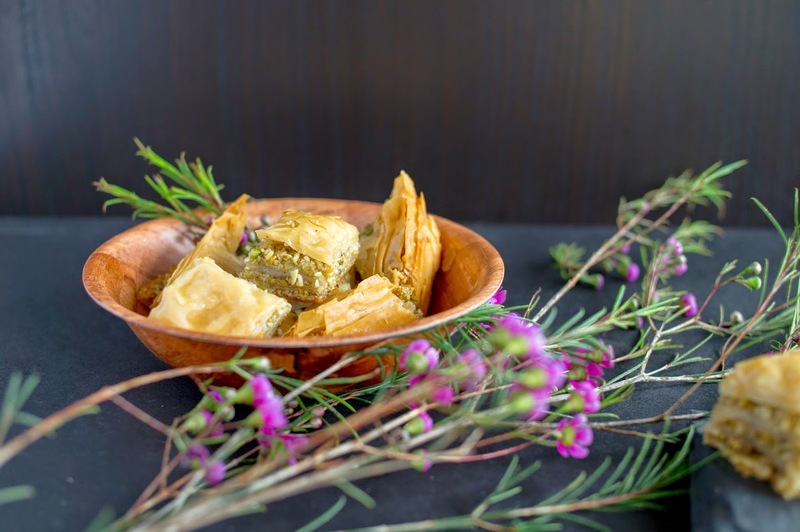 Bake the baklava in the center of the preheated oven for about 35 minutes or until the top is golden brown. If the baklava is browning too quickly, cover the top. Remove from the oven and spoon half the lavender honey syrup evenly over the whole surface. Wait for about 5 minutes and then spoon the remaining half of the syrup evenly over the surface. Allow the syrup to soak into the baklava for at least 3 hours or overnight.